I have installed Oracle Fusion Middleware 11.1.1.2 on my local Kubuntu 9.10 (64bit). This posting contains some tips based on my experience. Please have a look here to find more details about where to find the new Oracle Fusion Middleware Release. 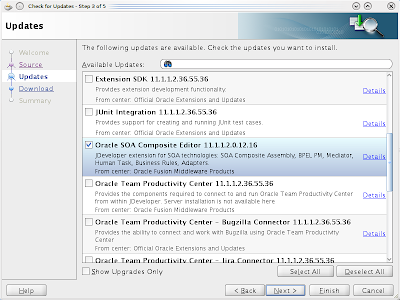 To install the new release you have to upgrade WLS to 10.3.2 and install the new SOA component again. I decided to throw everything away, download the complete new release including the new RCU and JDeveloper release (don't forget this component!) and install everything again.. Please follow the installation instructions, which can be found here, to install the components in the correct order. With my default OpenJDK version (build#16) I encountered problems with the WLS installer and with starting the installer of the SOA Suite component. This installer will guide you through the installation of WebLogic 10.3.2.0. Type "Next" or enter to proceed to the next prompt. If you want to change data entered previously, type "Previous". You may quit the installer at any time by typing "Exit". When I tried to start the SOA Suite installer using my OpenJDK as the java runtime the following problem showed up in the console and the installer UI did not show up. I assumed that something was wrong with my JDK version so I decided to install JRockit Realtime JVM version 6. After installing JRockit Realtime JVM version 6 and using this Java distribution for installing WLS and SOA Suite everything was able to install without any problems. The JRockit version I used is available from here. Install the extension and restart JDeveloper to activate the update. All of the above did the job for me. Useful information shared by you. Based on your experience and study , one can easily install and use the technology. Keep sharing. I'm happy to have found this blog! Thanks a lot for sharing this information with others! This is the best blog entry ever!